When you’re looking for a reliable contractor for garage floor resurfacing in Haslet and Fort Worth, TX and surrounding areas, call Custom Garage Works at 214-494-9068 or 817-308-1305! We have years of experience providing premium garage floor coatings to the DFW area, and unlike other garage floor resurfacing contractors, we’re committed to doing the job right. Gone are the days of unreliable epoxy floor coatings. We founded this company to create custom, quality garage solutions that you can count on for generations to come, and with us, that’s what you’ll get! The idea for Custom Garage Works® was born from hot, Texas afternoons spent working on late 60’s muscle cars in our dad’s garage. We spent countless hours in a cramped, dirty garage with poor lighting, squeezing under the car on the greasy, oil-stained floor. Our Dad taught us the workings of the engines in the muscle cars of his late youth. When we were in high school, we restored our own muscle cars, many of which were the same cars our Dad had loved and raced as a young man. Our father also gave us a strong work ethic and emphasized the importance of detail when taking on and completing a project. We knew there had to be an efficient way to make our garages cleaner, more organized, and frankly, just more enjoyable to be in. After exhausting research and testing, we were very unhappy with the low quality, cheap products that were on the market. We found cheap epoxy floor coatings put on top of acid etched concrete that would peel and flake after only a few months of use. We found low-quality cabinets that were nothing more than slightly modified closet cabinets. Our research also showed us that we weren’t the only ones looking for better garage solutions. Tapping into what I felt was an unmet need in the residential garage renovation market; we founded Custom Garage Works with the simple mission to bring impeccable design and quality to your garage. 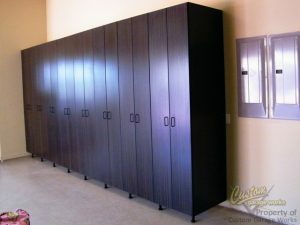 Our Garage Cabinets Are Durable, Sturdy, And Even Attached To The Wall For Added Strength! We searched throughout the industry to find the very best the industry had to offer. Our goal was to furnish a complete custom garage makeover with an industrial floor coating, superior garage cabinetry, and Slat-Wall storage systems. As a result, Custom Garage Works® offers a superior custom garage flooring system, packaged with some of the best cabinet systems manufactured in the industry that offer durability and a handsome design for home garage use. Our efforts resulted in the creation of an entirely new way of looking at your garage, with professional furnishings designed exclusively for the luxury showroom custom garage. At Custom Garage Works®, our job is complete when you walk into your garage for the first time and your knees go weak and your heart beats like the pistons of a 428 Cobra Jet 68 Shelby Mustang on a cool summer night. If you are looking for top quality garage floor resurfacing in Haslet and Fort Worth, TX or surrounding areas, give us a call at 214-494-9068 or 817-308-1305 to set up your appointment. We provide professional flooring and organization solutions to our clients, in DFW and the surrounding areas, and we look forward to serving you, too! Updated on September 19, 2018 at 6:25 pm by Custom Garage Works.